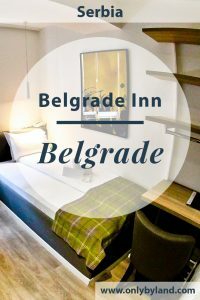 You should consider Belgrade Inn if you want a modern hotel within walking distance of the main attractions of Belgrade. For the best room rates, visit the Belgrade Inn website. For the latest events and pictures check the Facebook and Instagram feeds. To communicate quickly with the hotel, I recommend contacting them on live chat through their website or on Facebook messenger. Belgrade Inn is located a couple of blocks from Republic Square. Republic Square is the center of Belgrade so the location is perfect. Furthermore, it’s a short walk to the famous Belgrade Fortress. 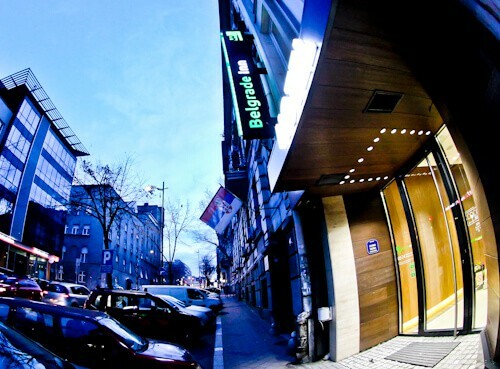 In fact, all of the points of interest of Belgrade can be reached on foot from the hotel. If you’re arriving in Belgrade by car I recommend you contact the hotel in advance to arrange secure parking. The staff at the Belgrade Inn speak perfect English and will be happy you’re visiting Belgrade. When you arrive they’ll provide you with a tourist map and explain where the main points of interest of the city are. 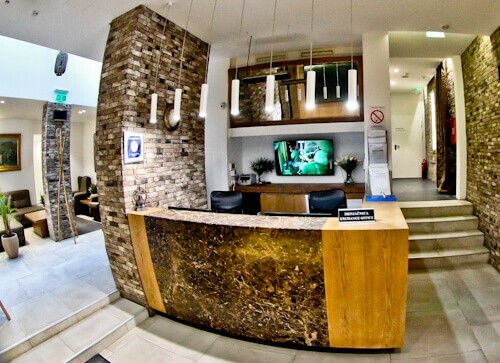 As well as checking in, you should appreciate the modern decor of the hotel. There’s also a comfortable lounge area located next to the reception. It’s also possible to book a tour of the city or a trip to Avala Tower through reception, it’s worth asking about these. The modern decor of the hotel extends to the guest rooms. In addition to the modern decor, there is complimentary coffee in the room. The fast, reliable WiFi works well in the rooms too. The flat screen TV is complimented with a huge variety of cable TV channels in English. The desk is useful for those traveling to Belgrade on business. For business travelers a conference room is also available in the hotel. The guest en suite bathroom comes equipped with all necessary amenities. When you shower, you have the option of a regular shower or a rainfall shower. The huge mirror is perfect for those who like to pose. The answer to the common question, ‘is there a hairdryer in the room’ is yes, conveniently located next to the huge mirror. 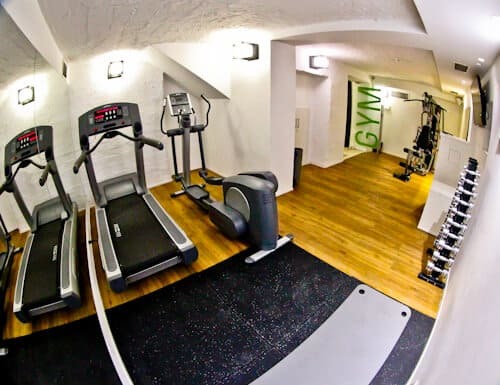 For those who keep fit whilst traveling, you’ll be able to make use of the onsite fitness center. You’ll find a cross trainer and running machine in addition to the light dumbbells. For those who like to practice yoga, you can stretch out on the floor mat. If you require a heavier workout then there’s a multi use weights machine. 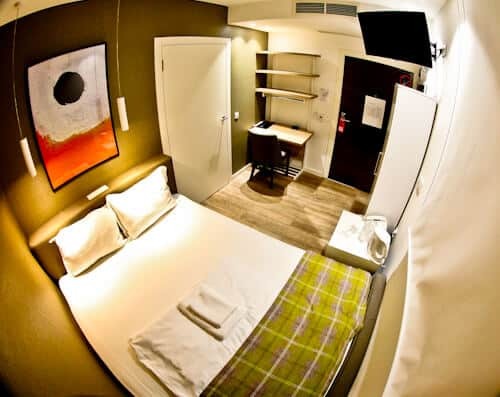 Those looking for a hotel with sauna in Belgrade will be happy at the Belgrade Inn. 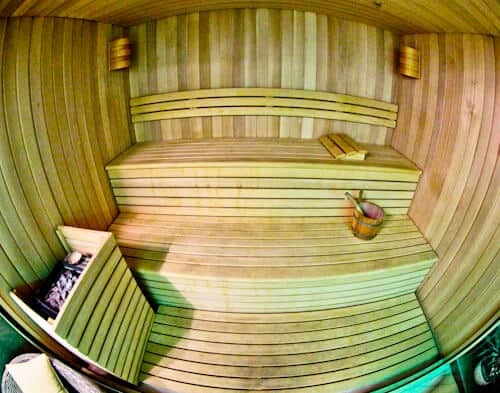 In addition to the sauna you have access to a steam room. It’s also possible to arrange a massage in the private massage room. Outside the sauna and steam room is a nice area to relax in. 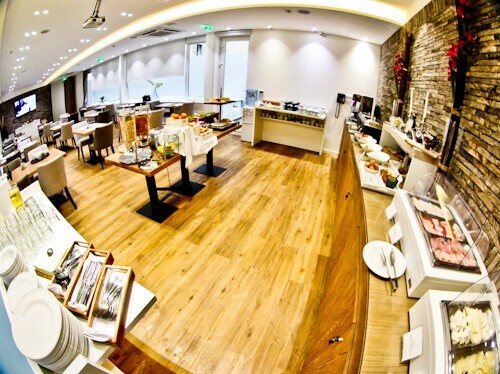 The hotel offers a complete breakfast buffet in the modern breakfast room. You’ll find hot meats, cold meats, eggs, fresh breads, sweet pastries, cereals, fresh fruits and yogurt. There are a few local Serbian offerings in the breakfast too, this is a good chance to try some of the local food. Hot tea and coffee are available in addition to cold fruit juices, milk and water. Make sure you ask about tours in the city when you check in. In addition, pick up a city map and have the staff circle the points of interest and restaurants offering local food. 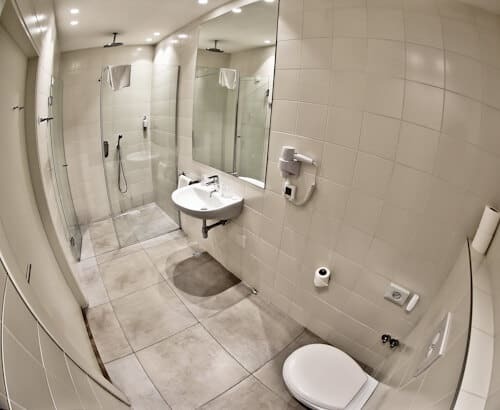 Whilst in the hotel be sure to take advantage of the facilities such as sauna, steam room and maybe even take a massage! Enjoy your stay at the Belgrade Inn. For the best room rates, visit the Belgrade Inn website. For the latest events and pictures check the Facebook and Instagram feeds. The hotel looks fantastic, I love the decor! I like how large the bathroom looks! It’s very useful to have an onsite sauna too! Hi Selena, I agree the decor was very chic – and it’s always good to have a sauna!